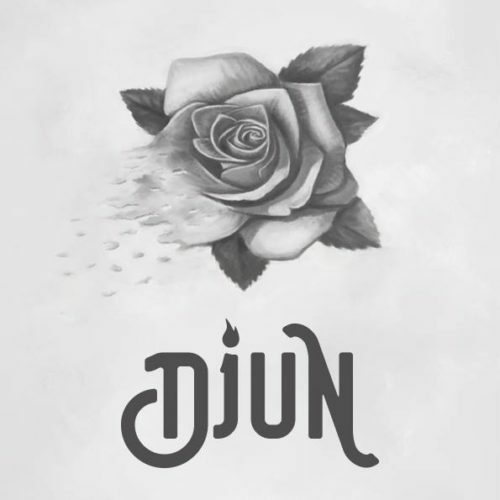 Wistful, melancholic, melodic: be prepared to get swept away by the songs of relative newcomers on the Maltese Alternative scene-Djun. The five-piece formulate music that’s made for chilling and able to take you off to a different headspace through reflective and relaxing poetry arrangements, crafted by songwriter and bass player Charles Cassar. We caught up with him ahead of Sunday’s gig at the Maria Mater Gratiae bandclub courtyard in Żabbar to find out a little more about the creative process! Hey Charles! Tell us, who makes up the band Djun? 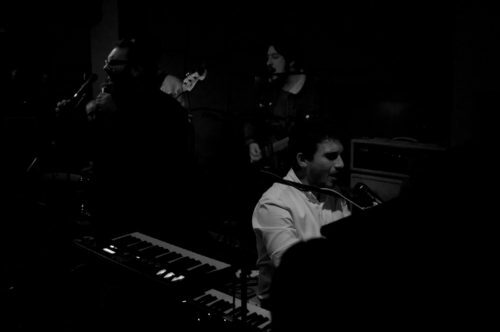 Charles Cassar -bass and songwriting, Paul Torpiano -keys, Justin Galea -vocals, Ryen Refalo -guitars and Michael Vella Zarb on drums. You’re a relatively new band, how and when did you get together? My old friend Zizza (Mark, from Brodu and Plato’s Dream Machine) and I got together to write songs and got the musicians together in 2017. Eventually Zizza amicably quit and was replaced by Michael. I see! What’s the starting point for your songs? The main themes were set in stone fairly early on, and the songs were written around the theme. Not exactly in the form of a concept album, but as a set of thematically linked pieces. Structurally, step one is usually myself fooling around on a classical guitar lent to me by my friend Franco Tartaglia (a fantastic guitarist), generally trying to figure out the most amusing chord shapes I can contort my hands into, and putting words and tunes to that. I can’t sing for the life of me though, so usually there’s a lot of translation and arrangement that needs to happen before the song is a finished product, but luckily the band is made up of very talented musicians who can transform my primitive ideas into something good. I can tell. You’re all very talented musicians! How would you describe your sound? Such sad. Many pop. Very major 7th. So what mood do you need to be in to write? Any mood will do, what I need is time! Are you working on any new projects? Is there going to be an album to look forward to? We’ll be recording our debut album ‘Il-Ħlas’ over summer, and hopefully releasing it before the end of year. Great stuff! Your songs are very relaxing… what do you do to relax? What album are you listening to most at the moment? The latest album by the Arctic Monkeys, a very welcome change in musical direction with lots of songwriting geekery built in. What musicians inspire your sound most? I listened to a lot of singer-songwriters in the run up to this album, Sufjan Stevens, the Genoese songwriters, Mac Demarco and lots of fashionably psychedelic pop like Tame Impala and Mild High Club. I’ve spent a lot of time writing music with my friend Zizza over the years, and we borrow each others’ stuff from time to time. In fact you’re playing with Brodu this Sunday in Żabbar! Sounds like a night of contemporary Maltese music that’s not to be missed! What can we expect from the concert on Sunday? Profound, unshakeable sadness, and hotdogs. Sold! See you there and thank you! 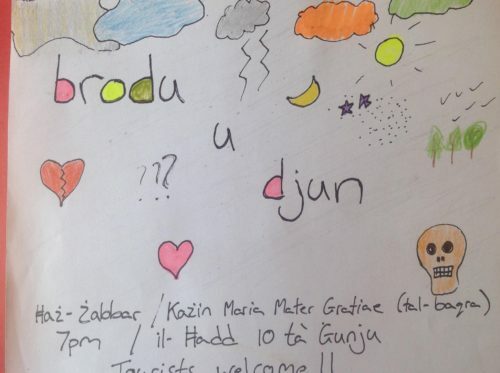 Tickets for Brodu U Djun in Ħaż-Żabbar on the 10th June can be purchased here!